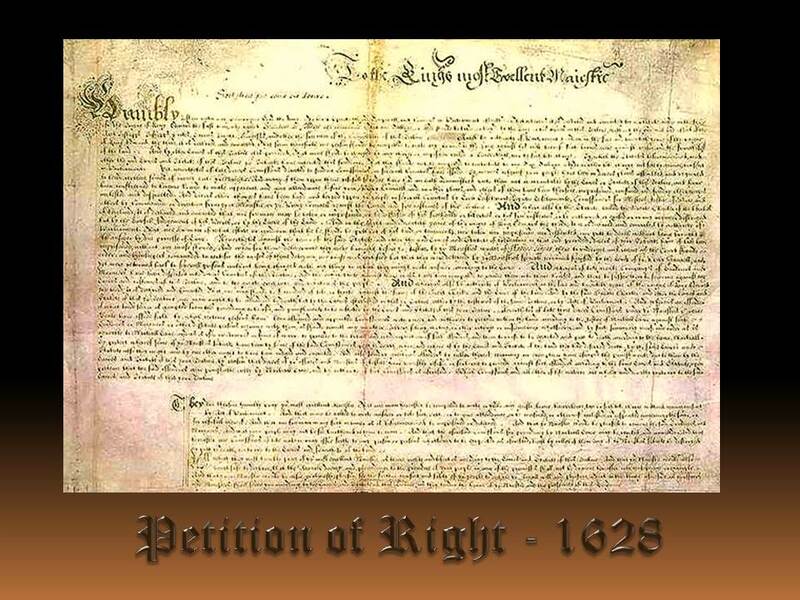 The Petition exhibited to his Majesty by the Lords Spiritual and Temporal, and Commons, in this present Parliament assembled, concerning divers Rights and Liberties of the Subjects, with the King’s Majesty’s royal answer thereunto in full Parliament. Humbly show unto our Sovereign Lord the King, the Lords Spiritual and Temporal, and Commons in Parliament assembles, that whereas it is declared and enacted by a statute made in the time of the reign of King Edward I, commonly called Stratutum de Tellagio non Concedendo, that no tallage or aid shall be laid or levied by the king or his heirs in this realm, without the good will and assent of the archbishops, bishops, earls, barons, knights, burgesses, and other the freemen of the commonalty of this realm; and by authority of parliament holden in the five-and-twentieth year of the reign of King Edward III, it is declared and enacted, that from thenceforth no person should be compelled to make any loans to the king against his will, because such loans were against reason and the franchise of the land; and by other laws of this realm it is provided, that none should be charged by any charge or imposition called a benevolence, nor by such like charge; by which statutes before mentioned, and other the good laws and statutes of this realm, your subjects have inherited this freedom, that they should not be compelled to contribute to any tax, tallage, aid, or other like charge not set by common consent, in parliament. Yet nevertheless of late divers commissions directed to sundry commissioners in several counties, with instructions, have issued; by means whereof your people have been in divers places assembled, and required to lend certain sums of money unto your Majesty, and many of them, upon their refusal so to do, have had an oath administered unto them not warrantable by the laws or statutes of this realm, and have been constrained to become bound and make appearance and give utterance before your Privy Council and in other places, and others of them have been therefore imprisoned, confined, and sundry other ways molested and disquieted; and divers other charges have been laid and levied upon your people in several counties by lord lieutenants, deputy lieutenants, commissioners for musters, justices of peace and others, by command or direction from your Majesty, or your Privy Council, against the laws and free custom of the realm. III. And whereas also by the statute called ‘The Great Charter of the Liberties of England,’ it is declared and enacted, that no freeman may be taken or imprisoned or be disseized of his freehold or liberties, or his free customs, or be outlawed or exiled, or in any manner destroyed, but by the lawful judgment of his peers, or by the law of the land. And in the eight-and-twentieth year of the reign of King Edward III, it was declared and enacted by authority of parliament, that no man, of what estate or condition that he be, should be put out of his land or tenements, nor taken, nor imprisoned, nor disinherited nor put to death without being brought to answer by due process of law. Nevertheless, against the tenor of the said statutes, and other the good laws and statutes of your realm to that end provided, divers of your subjects have of late been imprisoned without any cause showed; and when for their deliverance they were brought before your justices by your Majesty’s writs of habeas corpus, there to undergo and receive as the court should order, and their keepers commanded to certify the causes of their detainer, no cause was certified, but that they were detained by your Majesty’s special command, signified by the lords of your Privy Council, and yet were returned back to several prisons, without being charged with anything to which they might make answer according to the law. And whereas of late great companies of soldiers and mariners have been dispersed into divers counties of the realm, and the inhabitants against their wills have been compelled to receive them into their houses, and there to suffer them to sojourn against the laws and customs of this realm, and to the great grievance and vexation of the people. VII. And whereas also by authority of parliament, in the five-and-twentieth year of the reign of King Edward III, it is declared and enacted, that no man shall be forejudged of life or limb against the form of the Great Charter and the law of the land; and by the said Great Charter and other the laws and statutes of this your realm, no man ought to be adjudged to death but by the laws established in this your realm, either by the customs of the same realm, or by acts of parliament: and whereas no offender of what kind soever is exempted from the proceedings to be used, and punishments to be inflicted by the laws and statutes of this your realm; nevertheless of late time divers commissions under your Majesty’s great seal have issued forth, by which certain persons have been assigned and appointed commissioners with power and authority to proceed within the land, according to the justice of martial law, against such soldiers or mariners, or other dissolute persons joining with them, as should commit any murder, robbery, felony, mutiny, or other outrage or misdemeanor whatsoever, and by such summary course and order as is agreeable to martial law, and is used in armies in time of war, to proceed to the trial and condemnation of such offenders, and them to cause to be executed and put to death according to the law martial. VIII. By pretext whereof some of your Majesty’s subjects have been by some of the said commissioners put to death, when and where, if by the laws and statutes of the land they had deserved death, by the same laws and statutes also they might, and by no other ought to have been judged and executed. And also sundry grievous offenders, by color thereof claiming an exemption, have escaped the punishments due to them by the laws and statutes of this your realm, by reason that divers of your officers and ministers of justice have unjustly refused or forborne to proceed against such offenders according to the same laws and statutes, upon pretense that the said offenders were punishable only by martial law, and by authority of such commissions as aforesaid; which commissions, and all other of like nature, are wholly and directly contrary to the said laws and statutes of this your realm. They do therefore humbly pray your most excellent Majesty, that no man hereafter be compelled to make or yield any gift, loan, benevolence, tax, or such like charge, without common consent by act of parliament; and that none be called to make answer, or take such oath, or to give attendance, or be confined, or otherwise molested or disquieted concerning the same or for refusal thereof; and that no freeman, in any such manner as is before mentioned, be imprisoned or detained; and that your Majesty would be pleased to remove the said soldiers and mariners, and that your people may not be so burdened in time to come; and that the aforesaid commissions, for proceeding by martial law, may be revoked and annulled; and that hereafter no commissions of like nature may issue forth to any person or persons whatsoever to be executed as aforesaid, lest by color of them any of your Majesty’s subjects be destroyed or put to death contrary to the laws and franchise of the land. All which they most humbly pray of your most excellent Majesty as their rights and liberties, according to the laws and statutes of this realm; and that your Majesty would also vouchsafe to declare, that the awards, doings, and proceedings, to the prejudice of your people in any of the premises, shall not be drawn hereafter into consequence or example; and that your Majesty would be also graciously pleased, for the further comfort and safety of your people, to declare your royal will and pleasure, that in the things aforesaid all your officers and ministers shall serve you according to the laws and statutes of this realm, as they tender the honor of your Majesty, and the prosperity of this kingdom.